The canal team will gradually be installing waymarkers along the route as restoration work is completed. The waymarkers display the QR codes and you can also download the audio from the website at each page. 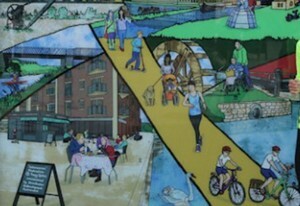 The focal point of our trail and where the Cotswold Canals Trust have a Visitor Centre. Pop into the visitor centre for a warm welcome and lots of information about the Stroudwater Navigation and the Thames & Severn Canal. 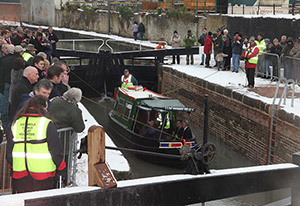 The lock outside the visitor centre was restored in 2012. Find out all about it on the audio recording. 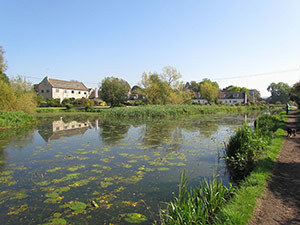 Ask the visitor centre staff about the lovely walk along the Thames & Severn Canal towpath and join the River Frome. 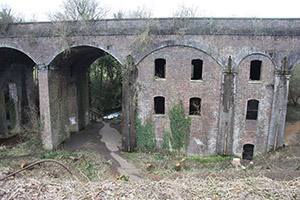 This site is undergoing massive change at the time of developing the trail. You'll see big changes over the coming months! A peaceful and tranquil place to visit, the Ocean is a great place to spot wildlife. Once an important place for trade, the port is set to come back to life in another chapter of the restoration. For now a walk round paints a picture of the past and exciting ideas for the future. 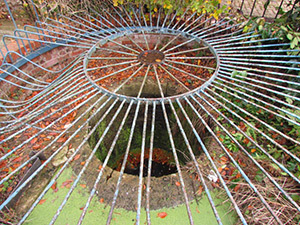 Listen to the audio to find out about this unusual structure. 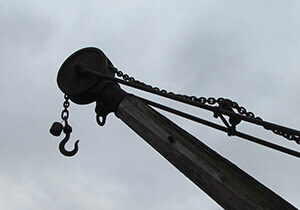 Look for the old crane alongside the towpath, just behind a fence. Today, it's a rare working example, but just a century ago, the wharves all would have had cranes like this. 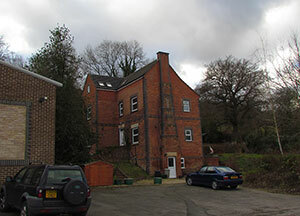 The impressive structure of the mill dominates this area. It's worth taking a good walk around to see this interesting collection of buildings. 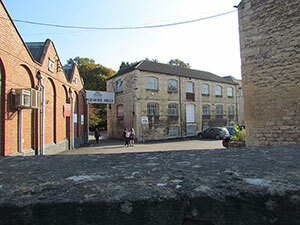 The River Frome is still running behind the mills and you can see Rodborough Common through gaps in the buildings. 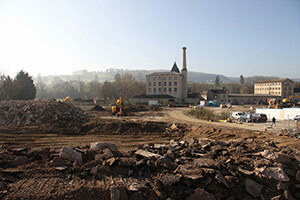 Almost in town now, find out about nearby buildings alongside the canal. A famous boatbuilder had a yard here, as the audio explains, making boats too big for the canal, being sold all over the world! 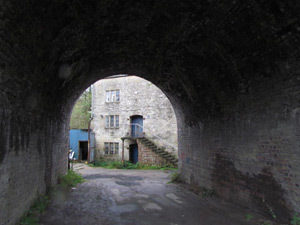 Take a walk just beyond the towpath to find real gems of Cotswold industry along the path through Lodgemore Mill. 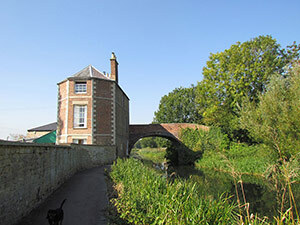 You'll see all sorts of structures associated with the mills and the River Frome. 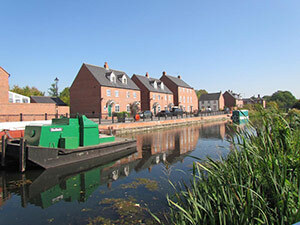 This quirky canalside building is a popular local landmark. Views across the fields make this an attractive place to walk. 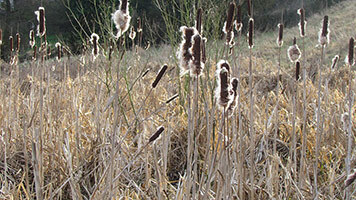 Now on the edge of Ebley Village, it a short walk to this place from Ebley Mill. 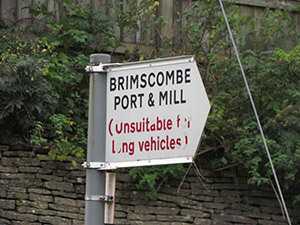 Have a look for the sign all about the nearby Oil Mills. You'll have to walk quite a way to find the lock, but its worth the effort. 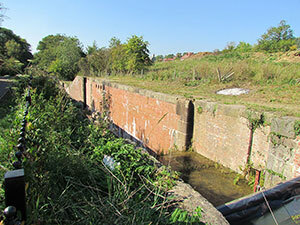 In 2012 the Cotswold Canals Project carried out work to restore this lock. Not long ago, it had no lock gates and looked pretty derelict. Today it's a working structure! 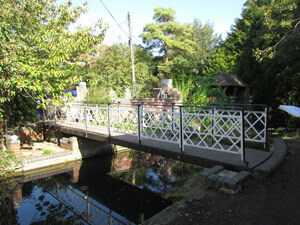 Check out this pretty bridge, put in by volunteers. 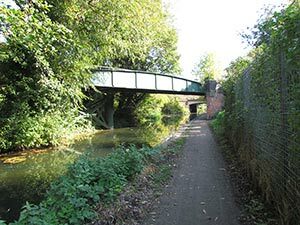 With the River Frome running along very close to the canal, its easy to see how the canal was built to follow the river valley. Another former wharf that used to be busy with boats and bargees. 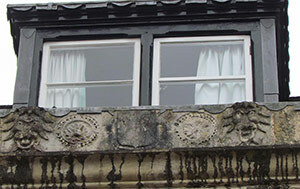 You can still discover clues to the past in old walls, signs and an old inn. What has it been like, living here after the canal was filled in? 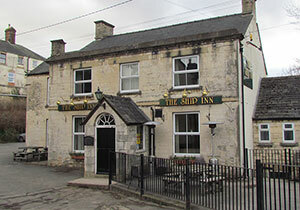 The landlord of the pub talks about his life here. 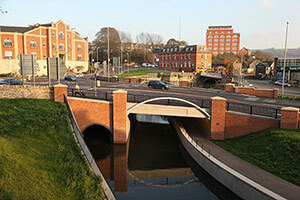 As its name says, the bridge is skewed across the canal at an unusual angle. Find out more in the audio. 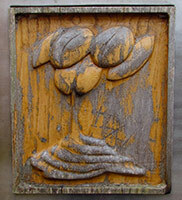 Once a place where boats were unloaded, the wharf is much quieter today and a popular place to live. 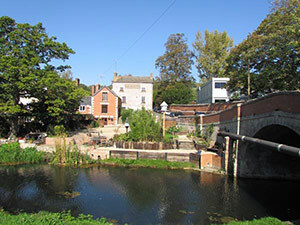 The end of our jouney for now, Bourne Mill is worth visiting to see the original port walls and with their entrances through into the port as well as the crystal clear River Frome, running close by under the mill buildings. The waterway is enclosed and quiet at this point. It's a good place for wildlife and there are more locks being restored and creating interest for walkers.